Should you care if you are not in San Francisco? Yes! That motorists searching for parking can add greatly to congestion is a very widely used argument for improved on-street parking management, especially performance pricing. To be precise, the Examiner article questions "the statistic that 30 percent of all congestion in the City is caused by frustrated drivers circling the block for that elusive parking space." Err. Thirty percent of traffic is not the same as thirty percent of congestion. But, either way, does the SF Examiner article have a good point? Is this a gotcha moment for that 30% thing? Wait a minute! Let's take a step back first. My first reaction upon skimming the article was to say the article is holding up a straw man to easily knock him down. Is anyone really claiming 30% of urban congestion (or traffic) is cruising for parking? Not me. Not Donald Shoup. How much of this traffic (in Seoul in this case) is actually searching for parking? I can see how this morphed into a more general claim. But notice that he qualifies the "30% of traffic" with "of congested downtown traffic". Why did he do that? Because the studies he is citing have that specific focus. The studies are selective because researchers study cruising where they expect to find it - on streets where curb parking is under-priced and overcrowded. Detroit, USA 1927 A: DOWNTOWN location between 2 and 6 pm (presumably on a weekday). Found 22% of traffic was 'cruising for parking'). Detroit 1927 B: DOWNTOWN location between 2 and 6 pm. Found 34% as cruising percentage. New Haven, USA 1960: CBDs of New Haven and Waterbury, Connecticut, with three study times (quiet summer period, average November period, and pre-Christman rush period). Calculated that at least 17% of CBD traffic was parking search traffic. Freiburg, Germany 1977: CENTRAL Freiburg, with 74% of 800 tracked cars estimated to be searching for parking. Cambridge, Mass., USA 1985: Harvard Square BUSINESS DISTRICT, 10 am to 3:30pm (hence covering the lunch peak), estimating that 30% of cars were cruising fro parking. New York, USA 1993: MID-TOWN, West Side, 8-10am and 11am-2pm, finding 8% of traffic was searching for parking. The point of all of this is NOT the 30% average! The point is to highlight that, parking search traffic is potentially a very big deal in CERTAIN IMPORTANT CIRCUMSTANCES. What circumstances? When on-street parking is badly managed and saturated, so that we get lots of search traffic (and waiting and double parking too). That is how I have always understood the talk about parking search traffic being a significant percentage of traffic. But these studies dating back to 1927 are mainly of historical interest. The data were probably not very accurate when they were collected, and the results depended on the time of day, the specific place, and the season when the observations were made. Nevertheless, these studies do show that parking search is potentially an enormous source of congestion and unnecessary traffic in busy business districts when on-street parking is mismanaged so that it is often totally full. But because curb parking is underpriced and overcrowded in the busiest parts of most of the world's big cities, the sun never sets on cruising. More recent investigations in New York City commissioned by Transportation Alternatives confirmed that parking search CAN be a huge share of traffic in busy areas. In 2006, on Prince Street in Soho (pdf) on Tuesday, Friday and Saturday afternoons/evenings, they found an average of 28% of intercepted motorists (at traffic lights) were looking for parking in the area. On Saturdays the share was 41%! In 2007, in Park Slope, Brooklyn (pdf), they looked at four periods (weekday peak, two weekday moderate times, and weekend peak) and found overall 45% of traffic was cruising for parking. So, like the studies cited by Shoup, both of these NYC studies focused on problem places at problem times. We can't extrapolate to a general claim about shares of traffic. But again they highlight how extreme parking search traffic CAN BE. But let's get back to the San Francisco Examiner. Does the article have a good point or not? Sadly, maybe it does. I thought it was bashing a straw man, but no. There really has been some fast and loose talk about the 30 percent thing. “Circling for parking accounts for approximately 30 percent of San Francisco’s congestion,” said Tom Nolan, Chairman of the SFMTA Board of Directors. SFPark is San Francisco's Performance Pricing trial. It has not been as controversial as many expected. Nevertheless, questioning a key SFPark claim makes good news copy. SFPark said the claim was based on Donald Shoup's book. There hasn't been a specific study of this in San Francisco. So I have to agree that it is a misleading claim. What is true is that, based on the Shoup-cited studies, parking search is very likely to account for a lot of San Francisco congestion. But no-one currently knows how much of San Francisco's congestion (or traffic) arises from cruising for parking. And I gather SFPark is not alone. Various others may have been getting a bit too attached to that specific 30% statistic, taking it as gospel, and using it in sloppy ways. By the way, it is easy to see how this happens. Quoted statistics, especially startling ones like this, tend to harden with time and distance from their origins. Donald Shoup's statement that parking search traffic was found in certain studies "to be on average 30% of congested downtown traffic" or my statement in a recent presentation, that parking search traffic is "often 30% or more" could easily become misleading if quoted beyond their original contexts discussing situations with badly mismanaged on-street parking. And with repeated mentions of that 30% figure, it seems to have morphed into a misleadingly precise and general claim about the percentage of overall traffic or congestion being due to parking search. And then, even more misleadingly, it was then claimed to apply to a specific place again, like San Francisco. Oops. cruising for parking CAN cause a huge mess in busy areas, at busy times, when parking is mismanaged. This point is still valid and not undermined by the discussion above. Parking saturation certainly causes traffic congestion (and other problems). How much exactly? Well, it depends. Do your own little study in the context you are interested in. But potentially it is a LOT. Much more than was widely realized before Donald Shoup came along. Pity about that 30 percent figure, though. The Metropolitan Transportation Commission in the San Francisco Bay Area has done a study which concluded that 60% of traffic in downtown Berkeley, CA is "cruising for parking." The city is implementing a program called goBerkeley to institute parking demand management in the downtown areas. Thanks very much, Len. Reinforces the point that in urban core locations with mis-priced parking, the parking search traffic can become a huge factor in traffic. Can you suggest a link to find the study? I couldn't find it with a quick search. I fully agree with Paul Barter’s post. It’s too simple to say that 30 percent of the traffic in San Francisco is cruising for curb parking. But what is a reasonable estimate? If you observe a congested street in San Francisco where all the curb spaces are occupied, what would be your best guess as to the share of cars that are cruising for curb parking? First, it’s important to ask what sort of street you are observing. If it is a major thoroughfare with lots of through traffic, such as Market Street or the Embarcadero, probably only a small share of the cars are cruising for curb parking. On the other hand, if it is a local street with little through traffic, perhaps all the cars on it are cruising for curb parking. If you were looking at a congested street in San Francisco today where all the curb spaces are occupied, what would be your best guess for the share of cars that are cruising for curb parking? Other than on major thoroughfares with lots of through traffic, about a third of all the cars does not seem like an overestimate. But you can easily calculate the percentage for yourself, using a simple technique I often use to get a quick estimate for a congested street where all the curb spaces are occupied. I approach the driver-side door of a car parked on the street, and pull a key ring out of my pocket, as if to open the door. If my wife is with me, she approaches the passenger-side door of the car. Often, this simple maneuver stops traffic on my side of the street, because the first driver to see me with my key apparently poised to unlock the door stops to wait until I leave the space. This stopped car blocks a lane of traffic just like a double-parked car. I then use body language to suggest that I have changed my plans and I leave the car, regrettably disappointing the driver who expected to park in the space. If you do this several times, and the first or second driver to see you with your key in hand stops to wait for a space, what share of the cars would you think are cruising? Probably more than 30 percent. Many thanks for the explanation, Donald. Valuable! Awesome comments! 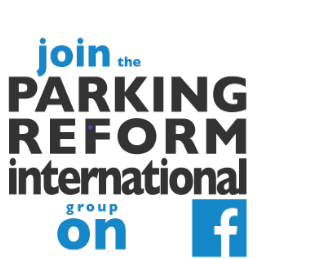 My team and I are currently tackling the recent spike in the US population and traffic concerns by working more with parking policy makers to change the way curb-side parking is regulated. Your work will be the bases of whats the come!